A great portable camera dolly in superb condition. Part of larger kit now being sold as I no longer use personal kit as I am working full-time for a United Nations specialised agency. The Wally Dolly Basic Dolly Kit with 3m Track & Bag provides you with the components to create smooth dollies on hard surfaces with no bumps along the track joins and minimal track squeaks. 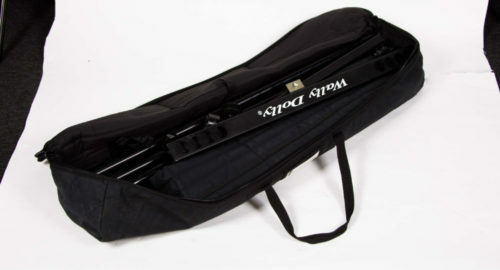 The included T-section tripod carriage supports up to eighty pounds of equipment, allowing you to use cameras from compact camcorders up to full-sized ENG cameras. The T-shaped dolly mounts to your tripod in place of a ground spreader, securing the legs. This puts the center of the tripod close to one side of the tracks, so take that into consideration when choosing which side to put the T-section on. The six polyurethane wheels ride on the included nine feet of track providing you a smooth ride with no pipe join bounces or squeaks. 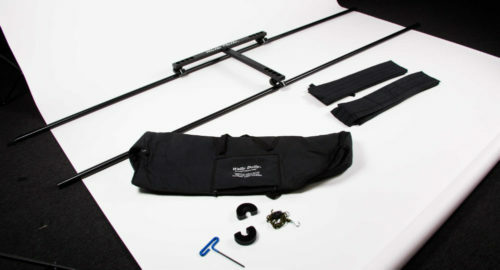 The dolly carriage breaks down into two easily assembled pieces for portability. It is pre-drilled to accept the optional Wally Dolly Low Boy 100mm Tripod Head Mount. 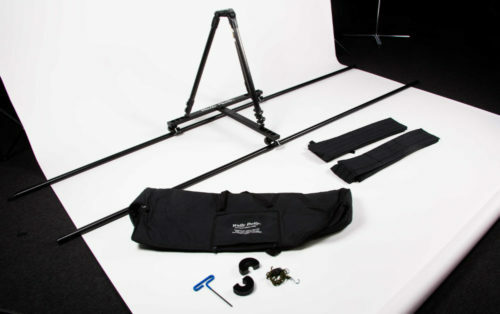 The nine feet of portable track comes as six track pieces featuring anodized aluminum construction that reduces squeaks and track noise when used with the Wally Dolly T-Section tripod carriage. The kit includes two track end stops, which can help prevent the dolly from rolling off the end of the track. The end stops are particularly useful when one person is operating both the dolly and camera, but are also appreciated by safety minded dolly grips. It includes two nine foot track pads, and a carry bag. Each 3′ section of track features male and female acetal screw joins for quickly connecting sections of track together. The acetal ends are replaceable in the unlikely event they are damaged. The T Section Tripod Carriage is designed to ride on the included 1.25″ O.D. anodized aluminum track from Wally Dolly. This combination allows the carriage to smoothly transition across track joins and is tested to be extremely quiet. The carriage features four cup like indents on each arm to capture the feet of your tripod. The carriage breakdowns into two sections for portability. The carriage incorporates a mounting hole for the optional Wally Dolly Low Boy, which is a 100mm bowl adapter. Anodized 6060 drawn aluminum tubes with a 1.25″ outer diameter support the weight of the optional T Section tripod carriage and up to eighty pounds of optional tripod, camera, and accessories. Each piece of track has a male and female replaceable acetal screw plug, allowing you to join together multiple pieces of track by screwing them into each other. This can result in a nearly limitless track run, with purchase of sufficient track pieces. The track is designed to run through a standard Australian door opening (32″) and lay on the included track pads. Please note that this track is meant to run on fairly smooth surfaces, and track joins must be supported. You can use the included track pads on hard or uneven surfaces, and you may skip the track pads when dollying on soft surfaces such as carpet. The included track ends provide safety and peace of mind, helping to prevent the dolly from running off the end of the track.